Everyone solves thousands of problems every day. Most of the problems are solved effortlessly by using knowledge and experience gained from solving similar problems in the past. We intuitively act without even noticing that there was a problem to solve. The problems of "what to have for breakfast?" or "what to wear?" would be difficult if we had never had the problems before. Choices become so routine that we probably don't even see alternatives. We get better as experience in a task builds particularly if we have access to quality training. But sometimes things go wrong and we need to use a stronger technique. There are many different techniques. Children ask mum or dad for the answer. In some organisations there is a culture of pushing problems up the chain. Organisations seeking the best results provide each level in the organisation with the skills, techniques and support to contribute to solving problems. The “5 WHYS” process was made famous by the Toyota organisation which recognises the front line people as one of the keys to success of the company. The 5WHYS process is incredibly simple but at the same time is powerful because a person must stop and focus on the problem enough to write down why it happened, and then why that cause happened. The simple act of stopping and writing and digging deeper has been shown to be very effective in most cases. In the cases where a solution is not found then at least the thinking has been done to create an initial appreciation of the problem so that it may escalate to more powerful techniques. Many organisations have used pieces of paper, note pads and printed templates to provide reminders and clues for people new to writing “5 WHYS”. Templates and printed pads are a great way of getting people into the habit of writing 5WHYS. However the advent of phones with screens, and widespread access to internet connected computers has revolutionised the way that 5WHYS are recorded and used. Most people in the workforce are now familiar with applications and find it more convenient to store notes on their phones or tablets. In some organisations personal phones are used but many (rapidly becoming most) organisations provide tablets for data reporting where previously paper reporting would have been used. The huge advantage is that the data goes into a system that can store and show data to reveal patterns. This allows people to work on the larger, often hidden and unretreated problem, rather than just working on local symptoms. It is often the case that a problem causing a system loss is perceived to be an isolated case. The person performing the 5WHYS looks at that particular case and applies a countermeasure for that particular circumstance. Another person on a different shift may see different symptoms and the issue may repeat a few weeks later. The ability to see all of the 5WHYS generated over a period of time provides the opportunity to see the patterns and the bigger picture so that countermeasures may be applied that properly address the root causes. One of the frustrations with paper based 5WHYS is that some problems prove to be “too hard”. Escalation to a team based A3 process is strongly recommended but again frustration sets in if solutions aren’t found. The solution is to capture the 5WHYS and A3 in software, so that the organisation can learn from the work of the first responders and escalate to stronger techniques if justified. Here is a video showing how 5WHYS can be entered into software. 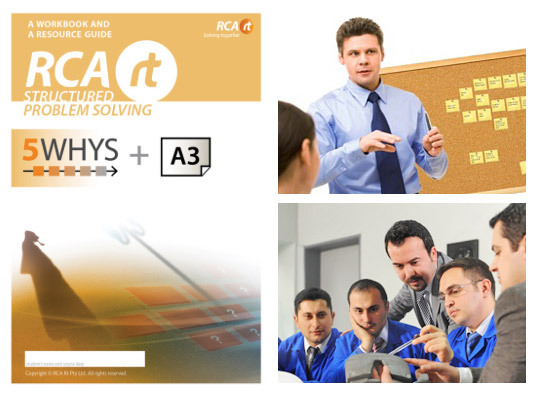 Click here to read more about how to provide a process that enables escalation from 5WHYS to cause tree Root Cause Analysis (RCA) if needed and justified.